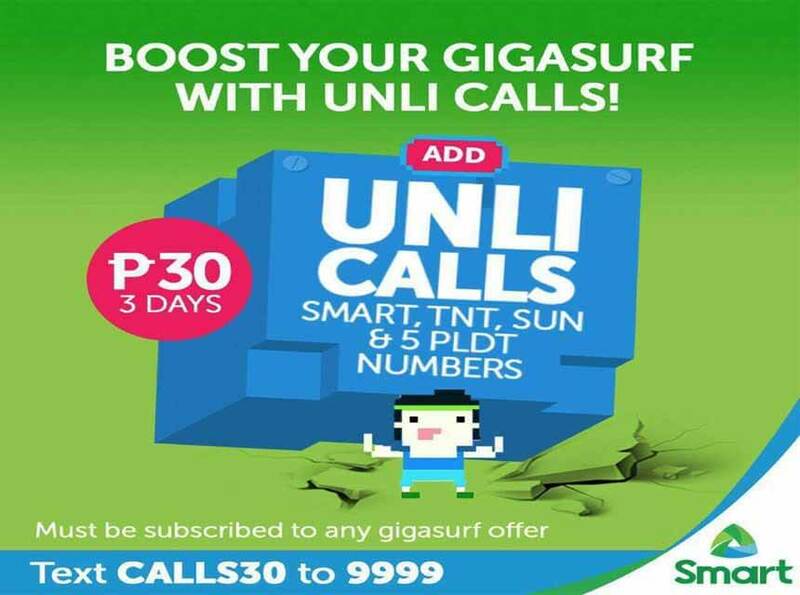 Smart offers add-on to their GIGASURF promo call CALLS30, 30 pesos unlimited call valid for 3 days. You can call to the same network, Talk N Text and Sun Cellular that is popularly known as TRINET. There’s more to this unli call promo, you can also get 3 days non-stop calling to 5 PLDT numbers of your choice while enrolled to CALLS 30. You can take the communication with your friends and love ones to another level than the usual social media messaging conversation. What can you say about this new promo? Is it affordable for you? Are you interested to avail or you have an alternative cheaper promo than this one? Please note that this is an add-on or booster promo, you can’t register it alone. 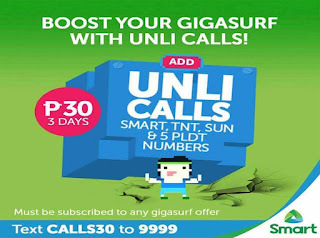 To register with Smart CALLS30, you need to subscribe to GIGASURF promo first, then add up 30 pesos to avail this offer and enjoy 3 days unli call to mobile and landline. To call PLDT numbers, just dial the area code before the 7-digit landline number. Check out all Unli Call Smart promo - from 20, 30, 50 up to 500 pesos budget. After registration, wait for SMS notification from Smart before you start dialing any number on your contact list. Make sure you have P1 maintaining load and active GIGASURF subscription to continue using this GIGA Booster CALLS 30 promo for 3 days. Any prefix when using that promo? (Calls)?